The swirl of a skirt, the sheen of satin, the colors of a cape – costumes in a musical, production or performance play a large role in the success of the event. Along with the set design, they add the visuals that help draw you into the story line. The Theater wardrobe departments go to great lengths to work out every detail needed to authenticate the characters. 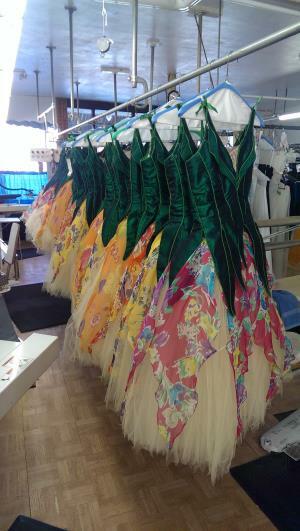 In between performances, or when one is over, the costumes get cared for by a fabric care professional that can accommodate a variety of intricate constructions. In Cincinnati, that professional is Kroner Dry Cleaners. Kroner’s handles everything from 5 foot snowmen and pink hippopotamuses for the Cincinnati Pops, to the Ballet’s delicate sugar plum dresses, period pieces from the Playhouse in the Park and beautiful gowns from the Opera. KInitially established as a West Side neighborhood dry cleaner in 1939, Kroner’s pickup and delivery program has extended their service area. “With changing clothing habits and demand in the downtown area our dry cleaning neighborhood has expanded. The arts world is alive and well in Cincinnati and we’re glad to be part of its success,” says Kroner. All of the show’s wardrobes travel around the country to the next theatre groups. Maintaining these garments is crucial to the costume investment. So, the next time you go to a performance keep in mind that behind these world-class productions are local professionals providing support. Coming Soon to Mt. Adams!